As a Rush fan from the mid-1970's, I've followed them through all of their various incarnations and styles. In my opinion, they have never made a bad album but, again in my opinion, "Moving Pictures" is one of their finest. There isn't a weak track on the album. Tom Sawyer, Red Barchetta and the anthemic YYZ are just stunning. If you haven't heard much by Rush or you're looking to try them on for size, this is the album I'd recommend you buy first. 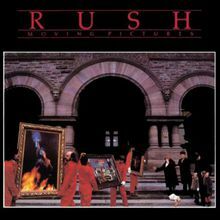 Most people who think of Rush think of this album, with the iconic "Tom Sawyer" as the first track on the album. But that song is just a gateway to a canvas of more amazing progressive rock that was far ahead of its time. My favorite is actually Red Barchetta, a song which fused together the best of all styles from every song on this album. If you own only one progressive rock album from any band in the 80's, make it this one.